SAN ANTONIO — The San Antonio Spurs didn’t dwell on nearly blowing a 24-point lead in the second half. They won, and that’s all that mattered to the veteran club. Tim Duncan had 29 points, 13 rebounds and five assists, and San Antonio overcame a fourth-quarter collapse to beat the Denver Nuggets 108-103 Wednesday night for its 15th straight victory. Tiago Splitter, Tony Parker and Manu Ginobili had 10 points apiece for the Spurs (55-16), who have the league’s best record. It just seemed like they were after overwhelming the Nuggets in the first half. Danny Green’s 3-pointer at the buzzer was his fifth of the half, giving San Antonio its largest lead of opening 24 minutes at 63-43. Green scored 16 points, all in the first half, before leaving with a foot injury early in the second. His status is unknown, but he wore a walking boot as a precaution after the game and will have an MRI on Thursday morning. San Antonio had 19 assists while going 24 for 42 from the field and forcing nine turnovers in the first half. Aaron Brooks scored 25 points and Kenneth Faried had 24 points, including 15 points in a frenzied final quarter for the Nuggets. Denver went on a 34-20 run in the final 11 minutes. After leading by as many as 24 points and by 20 midway through the third quarter, San Antonio needed Duncan’s late heroics to preserve its win streak. Duncan scored all but one of the Spurs’ final 11 points, capping his performance with an off-balance jumper off the glass for a 107-99 lead with 30 seconds remaining. The heavily contested shot sealed the win and led Nuggets coach Brian Shaw to turn and smile at Popovich, who shook his head as well. Duncan finished the game 12 for 20, including going 4 for 5 in the final five minutes on a series of layups and jumpers. It seemed like it was going to be an early night for Duncan and San Antonio’s veterans after the team rolled to a sizeable early lead. 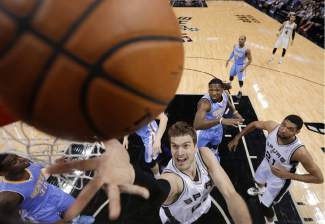 The Nuggets opened at a frenetic pace and the Spurs were more than willing to play along. The teams combined for 24 shots in the opening six minutes. Green and Kawhi Leonard benefited the most from the fast start, going a combined 4 for 5 on 3-pointers. Leonard got the Spurs started by swatting Faried’s jumper from behind off the opening tip and then hitting a 3-pointer and 19-footer to give San Antonio a 7-4 lead. Green then hit three consecutive 3-pointers to extend the advantage to 16-10 with 8 minutes remaining in the first quarter. Green ended the run by draining a closely contested 3 on Randy Foye after screaming for the ball as Duncan brought it up court off a rebound. NOTES: Spurs F Austin Daye has become an overnight fan favorite, receiving an ovation second only to Ginobili’s upon entering with 29.5 seconds remaining in the first quarter. After averaging just 2.3 minutes in four games since being acquired from Toronto, Daye scored a game-high 22 points in 29 minutes in a 113-91 victory over Philadelphia on Monday. … Spurs F Matt Bonner (right calf strain) missed his second straight game and his ninth due to injury this season.